A more gentle alternative for fine and thinning hair. 6 rings of boar bristle tufts stimulate blood flow to the hair roots, the density of the bristles allow conditioning sebum to be more evenly distributed from the roots to the ends of the hair. Mason Pearson Brushes Pure Bristle Sensitive is rated 4.9 out of 5 by 12. Rated 5 out of 5 by CarolineC from Lovely brush This is a lovely brush. I trust it will last me the rest of my life. Rated 5 out of 5 by 1MAR from Lovely brush I have inherited my Mothers' Mason Pearson brush, but found it a little hard for my scalp so I bought a new 'sensitive' brush which is a sheer delight to use. My hair feels so much better, shinier and curlier. I am so pleased that I bought the very small one for my handbag! I had always had a M&P brush in my teens as my Mother only used one, but had fallen out of the way of using one during my years in North America. I am so glad I now have a new one to use.. Rated 5 out of 5 by Jet3 from At long last I'm a proud owner of a Mason Pearson! Really pleased to receive my Mason Pearson SB3, having found a B1 to be too hard bristled on my tender scalp. 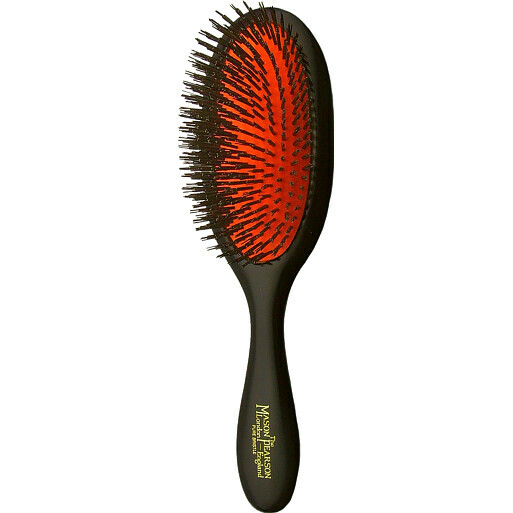 I really love this brush, it isn't so soft as to bend and not penetrate my hair, it's firm enough to stimulate the scalp yet not scratch it. Shipping from Escentual was really quick and tracked all the way, I received a text from Royal Mail on the morning of delivery! Overall I am very pleased I made my purchase.